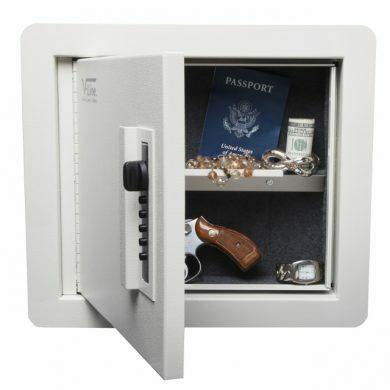 The Desk Mate handgun safe is designed to be mounted discretely under a desk or shelf for quick access to a single firearm or other valuables. The Desk Mate features an easily programmable, Simplex five push button mechanical lock that does not require batteries. 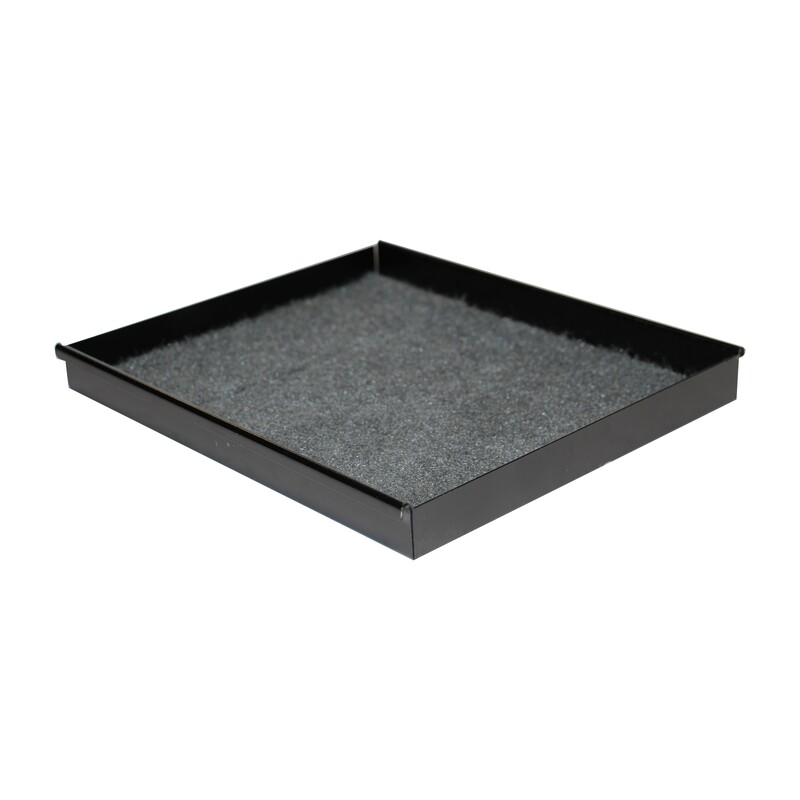 The Desk Mate handgun safe comes standard with a felt lined tray which can aid in organizing and accessing smaller valuables. 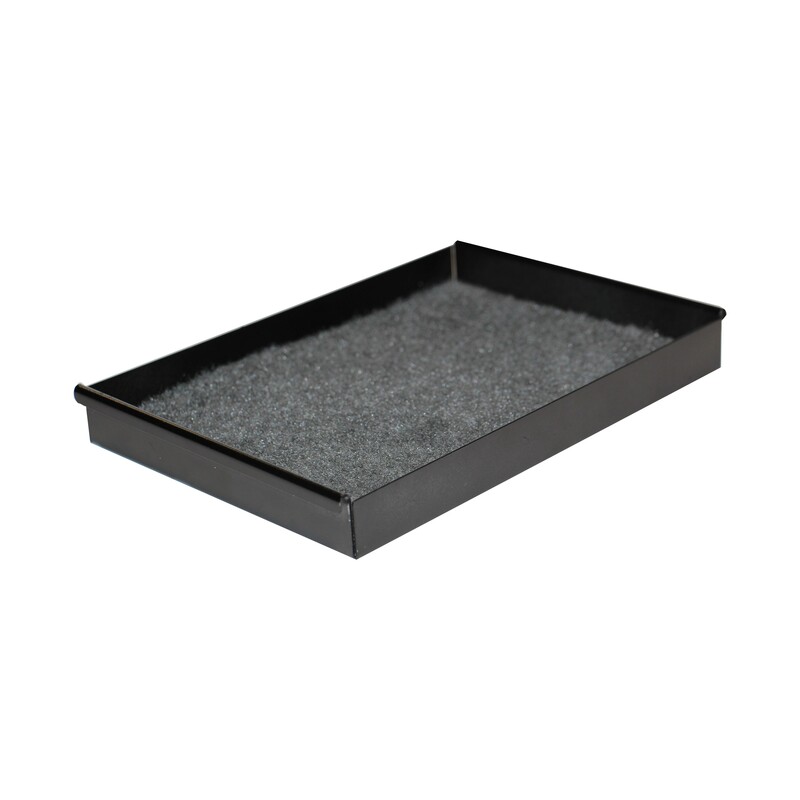 The bottom inside of the Deskmate is felt lined for protection of your valuables. The black powder coated finish on the case is accented on the dropdown drawer with a V-Line silver logo and stainless steel lock faceplate. 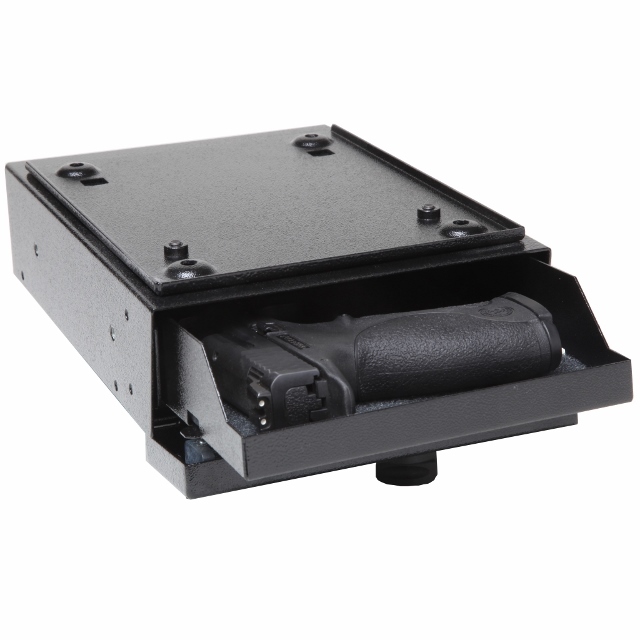 The Desk Mate handgun safe comes standard with a quick release mounting bracket (part no. 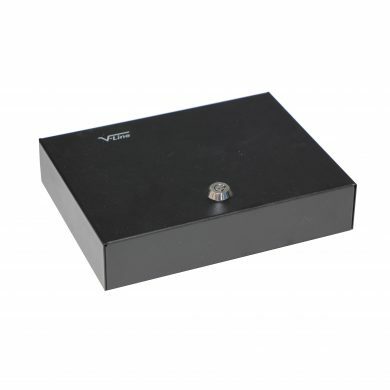 2597-MB BLK) which secures the case to the underside of most desks or shelves for security and easy portability. 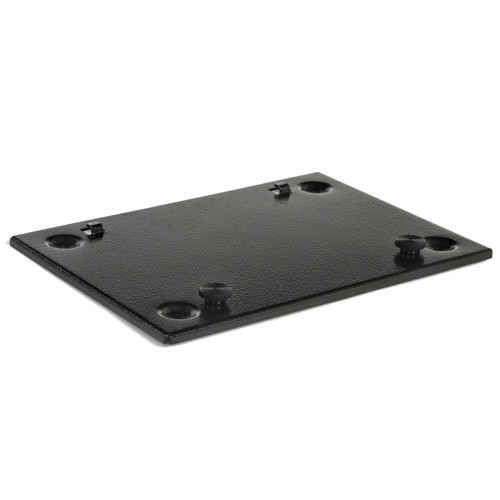 Anti-pry brackets in the interior of the Desk Mate provide additional security from prying. SKU: 851476006030. Availability: In stock Size: N/A Category: Home Security. Tags: bracket, desk mate, gun case, guns, lock box, made in USA, mount, protect, quick access, safe, Security, security case, simplex lock, storage, tray, under desk, V-Line Ind., valuables, vault. Perfect to secure a handgun where power is not easily accessible. Handgun is secure but can be rapidly accessed. Simply the best for reliability, quality and made in America. I found the safe to be easy to install and operate quickly, yet still be out of sight from curious eyes. The security is a good feeling no price can buy. I also appreciate the versatility available with additional mounting hardware available, not to mention, NO batteries or imported electronics to fail! Security at its best, great investment! Peace of mind knowing I have fast access to my weapon when needed yet secure from curious eyes is priceless. 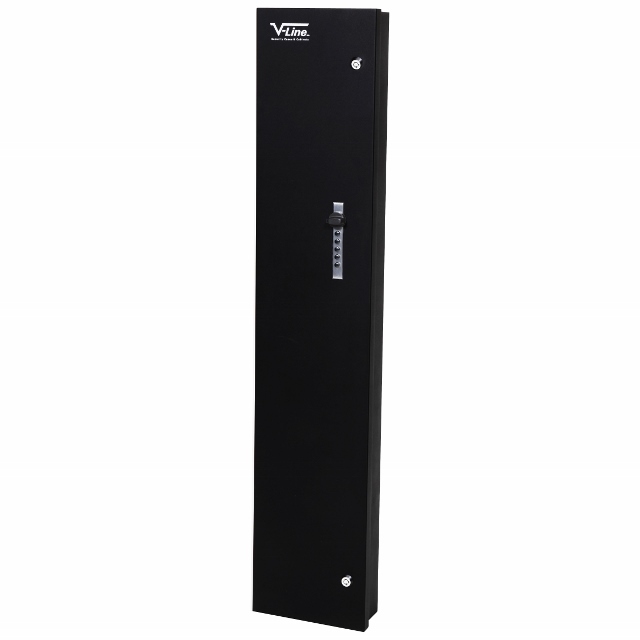 No worries of battery failure ever, customizable combination, its the best, I just bought my second V-Line gun safe. I feel its a great investment in safety and security. 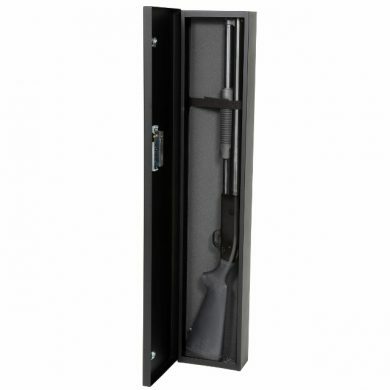 I researched many different gun safes for my desk before buying, and this product came out as the clear winner. After installing and using for a while, I am completely convinced this is the simplest and most effective safe for quick access to your handgun under your desk. 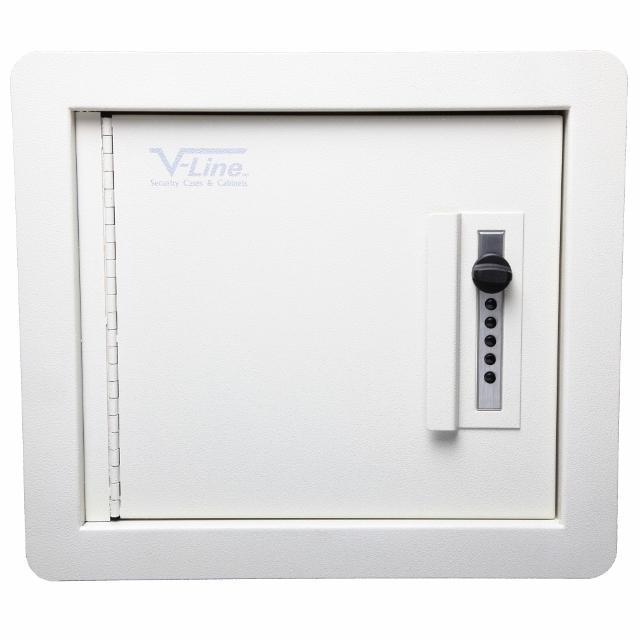 Solid safe and easy to operate mechanism. Set new combo with no issues. Opens every time without fail. Even tried to bungle it up and sloppily enter the buttons. Wife had no issues entering combo during live-fire home invasion exercise. Works great even in a rush. With tactile feedback, this is a breeze to open in low light or simulated blackout. Great tip included with packaging to get in the habit of turning the latch CCW before entering combo in order to clear previous entries. One handed entry with no batteries to die or finnicky electronics to fail. Everything I want and nothing I don’t. Such a robust and simple product w/ all metal construction. I have faith this product will stand the test of time. Thanks for making a great product, V-Line. Worth noting, this was easy to install with included bracket. If you have basic carpentry or handyman skills, you can install this in a variety of positions to suit your needs. 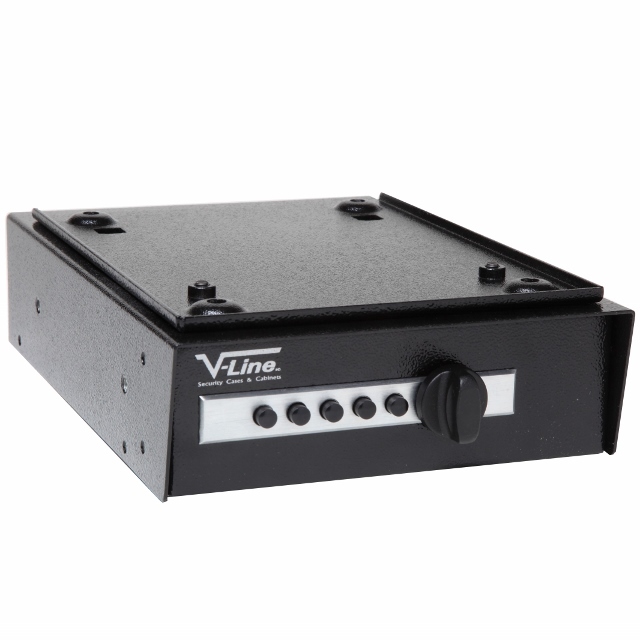 I purchased the V-Line Desk Mate handgun safe to install in my truck. I secured it to the floor under the back seat of my F-150 Crew Cab using the the Universal Mounting Bracket . Installation was straightforward for anyone with basic skills. The safe is out of view but still accessible. It’s the perfect solution for securing a handgun in a vehicle. I am happy that the bracket worked for you to install the Desk Mate in your truck! Solid and Secure. Large enough for my S&W Model 99 semi-automatic 40 Cal, with room for an extra magazine. Relatively easy to install and program the lock. Follow the instructions TO THE EXACT LETTER and you will have no problem. I did not follow them precisely for the first time or three, but finally figured it out. Keeps my handgun safe from my grandkids. Super easy to install, super easy to set up my own unlock code – a must have. 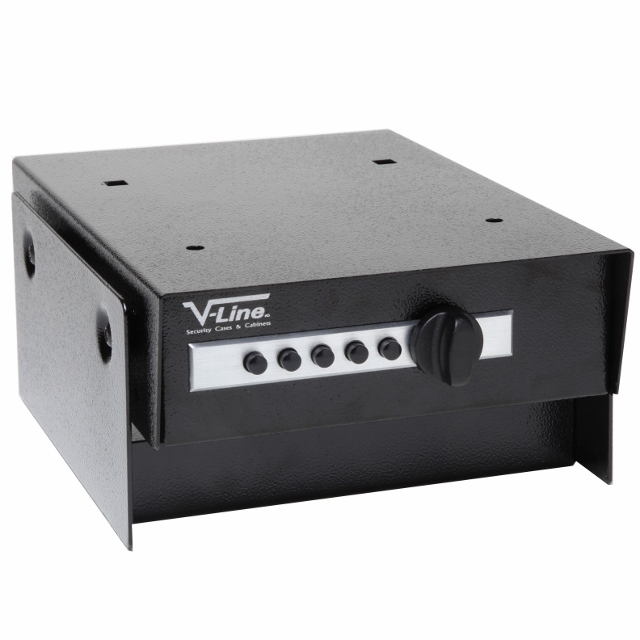 Excellent quality, easy to program, fast and easy to install and quiet compared to my other safe’s for my handgun. The best feature is the quick release combinations, practically impossible to crack and never have to worry about the battery or keys! High quality, solid unit. Excellent quality. Easy to use. Best part is no batteries to change. The Desk Mate was easy to install under a bedside wall mounted side cabinet with drawers. There was some rattle when operating the door so I backed off the nuts and slid a thin piece of vinyl seal between the safe and the mounting plate. Presto, quiet operation. Reprogramming the lock was easy. I like the mechanical lock, batteries are not reliable in critical situations and fail at the worst times. I also have a wall unit that I am abandoning in a house we just sold, and will mount another bottom mount V-Line from another house. I like the reliability of the mechanical lock and the sturdy case. Great quality sturdy product. Easily concealed but readily accessible. 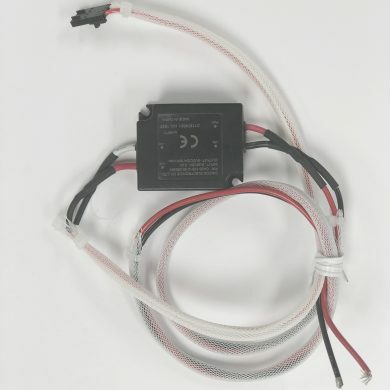 its so easy to program the lock and easy to install. The unit fits perfectly installed under my working desk. 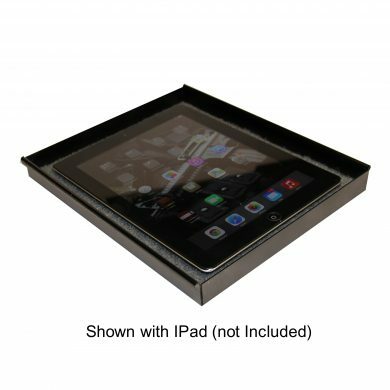 Its so discreet, no one knows its there, its invisible and yet its very accessible. I am planning to get another unit for my other handgun in a different room. 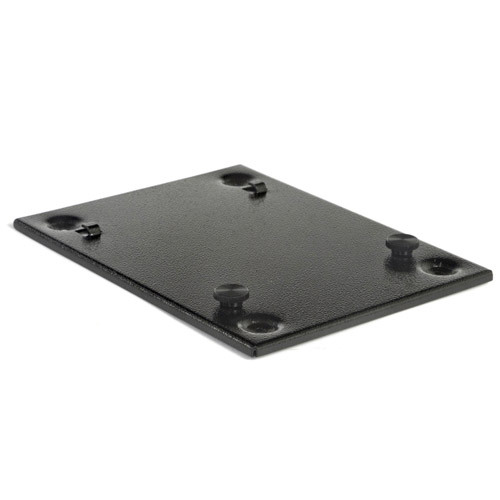 Designed to install under most surfaces with the included Quick Release Mounting Bracket (part no. 2597-MB BLK). 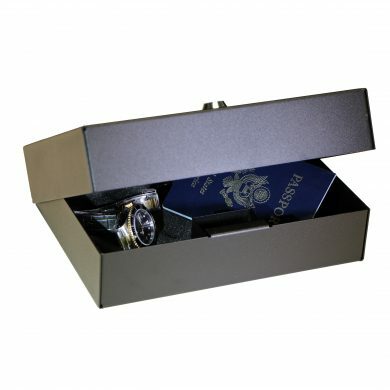 The Desk Mate handgun safe may also be installed sideways with the top bolted to the side of a surface and the door on the top. Genuine SIMPLEX five button mechanical lock for quick access with 1081 possible combinations, easy to set a personalize code. Accented with silver logo and stainless steel lock faceplate.